White Lodging announced today the “topping off” of its new hotel in Fort Wayne, signifying that the structural framework is now complete. The new 136-room Hampton Inn & Suites by Hilton Fort Wayne Downtown, immediately adjacent to Parkview Field and the Grand Wayne Convention Center, is on schedule to open in July 2019. 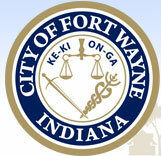 Fort Wayne Mayor Tom Henry today announced that the City’s Office of Housing and Neighborhood Services is the recipient of a $3,179,000 grant to remediate lead paint in older homes.